Building the business culture means improving the image of Vietnam and its competitiveness amid integration into the global economy, stated Prime Minister Nguyen Xuan Phuc at a ceremony in Hanoi on November 7. “This is one of the tasks of Vietnam’s constructive government and business community as well as part of efforts to turn Vietnam into a start-up nation,” he stressed. The government pays special attention to corporate culture and business ethics with the core values of transparency, creativity, competency and sustainability, he added. 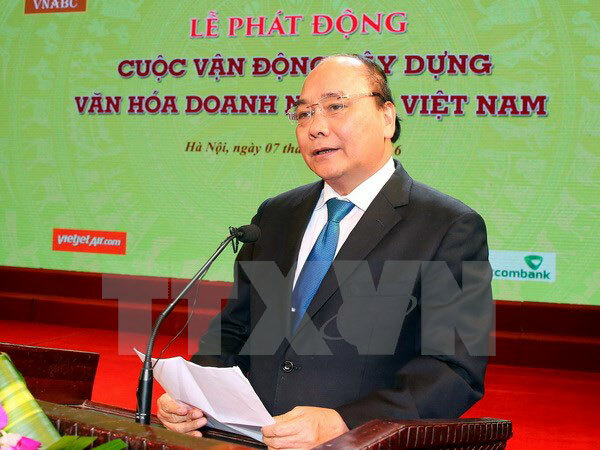 At the event, PM Phuc launched a campaign on building a corporate culture in Vietnam, focusing on raising public awareness, shaking up production and trade, and boosting the role of State agencies. The organising board also announced the PM’s decision to take November 10 as Vietnam Corporate Culture Day. The day aims to promote the building of a favourable business climate in Vietnam where law, business ethics, social responsibilities and healthy competition are respected. On the occasion, the Vietnam Association for Business Culture Development signed cooperation pacts on conducting the campaign with the Vietnam Association for Women Entrepreneurs and the Voice of Vietnam./.